Yes, it is which is simultaneously exciting and daunting but I feel so lucky to be performing alongside such a brilliant cast! Although this is my first time at Fringe, the company are returning this year after their successful run of “The Best Play Ever” in 2017. After 5-star ratings and excellent audience reviews, “The Best Play Ever” returns to the festival this year alongside the musical, which the entire company are buzzing about. From a personal stance, the biggest (and scariest) thing that has happened to me since last year’s fringe is graduating from the University of Manchester, obtaining a degree in Drama. My undergrad allowed me to establish both personal and professional relationships that I’m sure will last despite my return home to the South Wales Valleys. I feel privileged to haven been given this opportunity to perform with Delicious Theatre at this year’s Fringe Festival alongside such talented, lovely and sometimes human-hungry people. Little Shop of Horrors is such a weird, wonderful and witty little show. Although the original performance is set during the 1960’s, Delicious Theatre’s production reimagines a world of terrifying impact of temptation in our current capitalist civilization. The satirical musical by Howard Ashman and Alan Menken is both ridiculously silly and tragically poignant and has a talking sassy plant; what more could you want from a musical?! Delicious Theatre is a company set up in 2017 by University of Manchester graduates (and one Durham graduate!). The aim of the company is to contribute bizarre and comical work to cities’ fringe scenes that pushes the boundaries of convention and showcases young adults’ interpretations of the world around us. We want to reflect the hilariously ironic and messy planet we’re making theatre on. 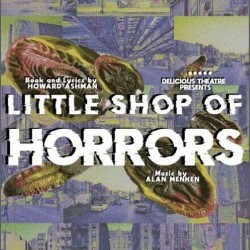 For Little Shop of Horrors, the cast are under the direction of Emily Oulton and the musical direction of Charlie Perry. Delicious Theatre’s sister show ‘The Best Play Ever’ of course (20-25 August, TheSpace on the Mile, V39)!! There’s a great deal of shows going to fringe this year that have originated from the University of Manchester such as new musical “The Fear” which is brilliant, alongside the drama societies productions of “Duck Gutters” and “Pomona” by Alistair McDowall. “Man Presents: Woman” is a girl power cabaret comedy has had great reviews AND has been produced by our very own Sophie Graci. (Co-founder of Delicious Theatre) “Flushed” by Catherine Cranfield was brilliant at the Manchester preview so everyone should go see that too! No Door Theatre Company are taking up “Bitter” this year after the success of “The Voices in Annie’s Head” at last years fringe, again, brilliant at the Manchester preview. “Living with a Dark Lord” by sisters Cait and Meave O’Sullivan had a fantastic audience response so I’m excited to see it at Edinburgh. Spies Like Us Theatre are taking both “Our Man in Havana” and “Woyzeck” this year and as I’ve seen work by the director Ollie Norton-Smith, it’s going to be super interesting! Physical theatre play “Action Man”, produced by Plaster Cast Theatre was fantastic in Manchester so I can not wait to see it again. Festivus Collective’s “The Henriad” looks like a must see as its a collaborative project with the University of Edinburgh and Manchester and retells shakespearean tragedies and comedies within a contemporary setting. Our other co-founder Katie O’Toole has produced a mint production of Sarah Kane’s ‘Crave’ from Durham University, and one of Emily and Katie’s friends Dan Richardson is in an amazing play called ‘Eat Me’ about people suffering from and surviving through the horrible mental illness that is anorexia. We cannot recommend all these shows enough – from working with these people over the last three years I’m sure you’ll be in for a treat.